Crocodiles are reptiles like snakes and lizards, but did you know they’re more closely related to birds and extinct dinosaurs? It’s true. Crocodiles are about the closest we’ll get to the ancient dinosaurs. Crocodiles have been around for 55 million years. They live in rivers, lakes and wetlands in many warm parts of the world. All About Crocodilians: Crocodiles are reptiles like snakes and lizards. 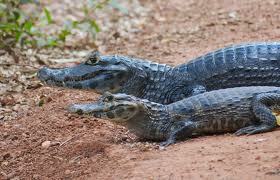 The crocodilian family includes alligators, crocodiles, caimans, and gharials. All these lizards have long snouts, sharp teeth and keen hunting skills. There are a few differences, though. Have you wondered how to tell the difference between a crocodile and an alligator? 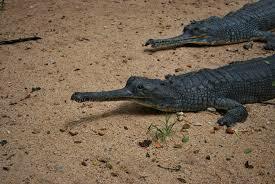 Crocodiles have longer, pointed snouts, while alligators have shorter, rounder snouts. Or, think about it this way: Alligators live in America; crocodiles don’t. Crocodilians are expert hunters. They have good eyes. They can see at night and under water. They also have good hearing. Crocodiles can hear their babies’ cries inside the eggs! Crocodiles will eat whatever they can catch – including wild pigs, water buffalo, deer, and sometimes humans. Crocodilians don’t chew their food. They bite off big chunks and swallow them whole. Caimans also belong to same family – Crocodilian. A video about the strength of a crocodile’s bite. Question 1: Are Crocodiles good mothers? Answer 1: Crocodiles are the best mothers of any reptile species. They take care of their babies after they hatch until they can take care of themselves. Crocodile mothers are very protective over their nest. If you ever happen to stumble across a nest leave immediately and quietly. Question 2: Are Crocodiles fast swimmers? Answer 2: Crocodiles are expert swimmers. They can stay under the water for up to one hour and can swim at 20 miles per hour. If you see warning signs telling you to beware of Crocodiles, never enter the water or stay around the water banks. Question 3: What is the largest species of Crocodile? Answer 3: The saltwater Crocodile is the largest species. 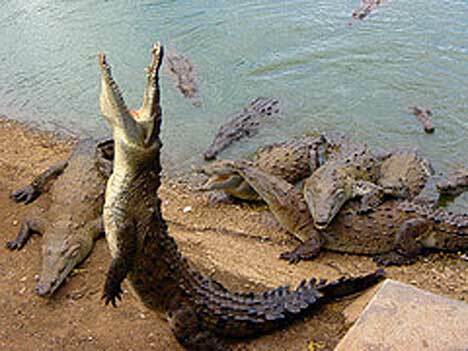 Saltwater Crocodiles are also known as Estuarine Crocodile, Marine Crocodile. 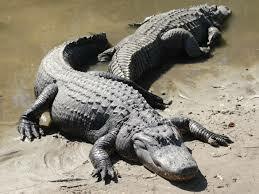 Saltwater Crocodiles are not only the largest Crocodile species, they are indeed the largest reptile on earth. Question 4: Do Crocodiles Sleep? Answer 4: Yes Crocodiles do sleep but they are extremely light sleepers. They have excellent hearing and are always alert. They can actually sleep with one eye open according to Australian studies. They can also sleep with their mouth open…..scary or what. Question 5: What is a baby Crocodile called? Answer 5: A baby Crocodile is called a Hatchling. Question 6: How long do Crocodiles live? Answer 6: A Crocodile can live 70 to 100 years old, similar to us. Enjoyed the Easy Science for Kids Website all about Crocodilians info? Take the FREE & fun all about the Crocodilians quiz and download FREE Crocodilians worksheet for kids. For lengthy info click here.